There are many different lawn diseases that affect different types of grasses. The effects of these diseases can be unsightly and aggravating to those who spend the time and money caring for their lawns and they can even be deadly to the grass plant itself. 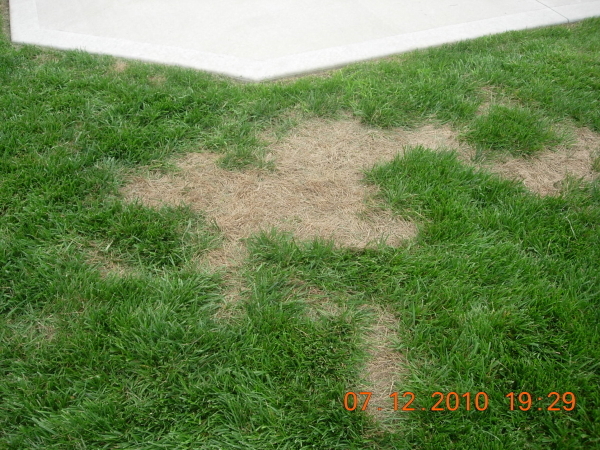 Summer patch is a fungus disease that mostly affects Kentucky bluegrass and annual bluegrasses. This disease typically strikes between June and September. Summer patch appears as irregular patches, rings, or crescents less than 10 inches in diameter. Summer patch exists in the lawn at all times but will only present itself when conditions are favorable for it. Extended periods of high humidity and daytime high temperatures above 82 degrees can cause summer patch. Poor air circulation, moist soil, and compact soil also contribute to these favorable conditions. If experiencing problems with summer patch, a soil analysis is highly recommended. The results of a soil analysis can determine the pH level of the soil and allow for recommendations on how to improve the pH to an appropriate level. If the soil has a pH higher than 6, it is more prone to this disease. How to Treat Summer Patch? Summer patch can be treated by incorporating disease resistant grasses into the lawn, such as fescue. Also being on the proper fertilization schedule and watering regime can help prevent the appearance of summer patch. If there are areas with poor drainage, corrections need to be made to improve the drainage. Aerating the lawn every year will help to loosen and create better air flow to the root system in any compacted or heavy traffic areas. If summer patch is severe, a fungicide application can be done. This can be costly because applications are needed every 3-4 weeks and require high amounts of water. To sum it up, summer patch like any other disease is unsightly but is treatable with the right amount of time and patience. It can be quite a nuisance for those that take care of their lawn or have a lawn care company take care of their lawn but following the recommendations for your lawn type and your area with proper practices can help prevent lawn diseases from appearing.